SugarSync review from BestBackups, looking at their strengths and weaknesses. Including an analysis of features, pricing, security and customer support. SugarSync is a good choice if you’re looking for a simple file storage system. Its somewhat limited features can be a little frustrating, but it provides excellent mobile access and well-developed file sharing options. You can read a detailed review below or sign up now. SugarSync offers three individual price plans, all of which give users access to the same features – the only difference is the amount storage space available. For $7.49 per month, you can backup 100GB, while 250GB will set you back $9.99 per month, and 500GB costs $24.99 p/m. There is also a plan for Business users, with coverage for 1 to 3 computers available for a monthly charge of $55, and the option to add more users for an incremental fee. Companies planning to cover more than 10 PCs are invited to develop a custom plan to meet their needs (with custom pricing to match). There’s also a 30 day free trial on offer for anyone who wants to take SugarSync for a spin before signing up, although you do unfortunately have to provide your card details in order to register. If you decide not to proceed when the 30 days is up, don’t forget to cancel your account or the first month’s payment will be taken automatically. SugarSync accepts payment from most major credit cards, or from PayPal if you prefer. SugarSync began its life as Sharpcast; a company focused on synchronizing image files between mobile and desktop devices. In 2008, Laura Yecies was named as Sharpcast’s new CEO, and just a few months later the company was reborn as SugarSync. Today, they have millions of subscribers around the world, including corporate clients such as Lenovo, Telecom-Orange, and BestBuy. Now presided over by CEO Mike Grossman, SugarSync’s primary focus is on providing top-end file sharing and synchronization options as part of an online backup package. As mentioned above, SugarSync is generally considered to fill the middle-ground between online storage and online backup systems – offering file versioning and above-average security features in the vein of backup providers, as well as the sync and share options usually associated with simple storage. Is it successful? We’ve taken a more detailed look at its features below. Like most online storage services, SugarSync only offers a limited amount of storage space – from 100GB to 500GB. While 100GB is probably adequate if you’re looking to store text documents and medium-sized collections of photos and music, those with large numbers of image and video files may need a greater allowance. If you want a little bit more space for free, all subscribers also have the option to earn extra storage space by completing tasks. Most of these are designed to get you using all of SugarSync’s features or encouraging your friends to sign up. For each person that subscribes on your recommendation you’ll get 200MB, while sharing a folder or downloading the mobile app will net you 125MB. If you’re committed enough to persevere, you can make a total of approximately 2.5GB of extra storage space. File versioning is the process whereby previous versions of your documents are retained by your backup provider. This gives you easy access should you ever need to view an earlier draft or retrieve deleted information. It’s a useful service offered by many backup companies, some of whom store unlimited versions, and others who save them for a finite period (most commonly 30 days). Although SugarSync does provide file versioning, they only retain the five most recent copies of your files; a very limited service compared to most of their competitors. In order to preserve your storage space, however, they do promise that only one version of your files will be counted towards your storage limit. Offering this service is clearly an attempt by SugarSync to incorporate more sophisticated features into a standard online storage service, but imposing such tight restrictions on its scope undermine their good intentions somewhat. It’s a step in the right direction, but if file versioning is important to you, you may be better off choosing another provider. In addition to versioning options, SugarSync also stores any files deleted from your computer hard drive for up to 30 days after you have removed them, so if you get rid of something by mistake you can easily restore it. Backing up your files is a manual process with SugarSync; understandable, as when you’ve got limited storage space it’s good to have maximum control over what gets uploaded and what doesn’t. This is great if you’re just looking to backup a selection of files to share or access from multiple devices, but isn’t particularly practical if you want to do a full system backup. SugarSync is compatible with Windows and Mac operating systems, as well as with Android and iOS. The mobile application gives you full access to your files, the option to backup documents straight from your device, and the ability to share data with family, friends and colleagues. File syncing also means that you can access up-to-date versions of your files from any device at any time. One of SugarSync’s greatest strengths lies in is its file and folder sharing capabilities. The folder sharing feature allows other users to access your files via a shared folder on your computer. Obviously, it is entirely up to you which documents you make available, and you can also alter permissions – making files either read-only or available for others to edit. In the vein of services provided by Dropbox and OneDrive, this feature removes the need to send large amounts of data by email, offering a quick and convenient way to share information. There’s no need to worry about things getting out of date either, as if you change a shared file, the alterations will be automatically synced to everyone else. You can also create a public link to shared folders, which can be posted on Facebook and Twitter, or included in an email. Unlike private folder sharing, recipients viewing public links won’t need a SugarSync account to download or view them – so you can easily share documents with large numbers of people. Subscribers wanting to backup files on the go can create a SugarSync email address for added convenience. Any email attachments sent or forwarded to this address will be automatically uploaded to the cloud – saving you the bother of having to download files to your registered computer. You can also link this service to your Gmail account, so that all email attachments are forwarded automatically to your SugarSync address. The average upload speed sat at 3.7 Mbps, with a 100MB file taking around four minutes to upload. It isn’t the fastest speed we’ve recorded, but to SugarSync’s credit, it’s not the slowest either. In fact, the majority of providers achieve average speeds of between 2 and 4 Mbps, placing SugarSync at the upper end of the competition. 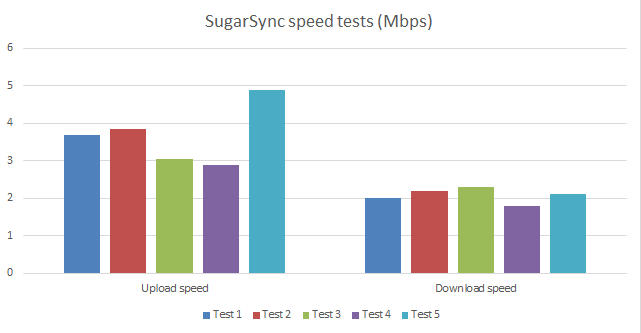 Unlike the majority of file storage and backup providers, SugarSync’s downloads were notably slower than their uploads, with an average speed of just 2.1 Mbps (the 100MB file taking approximately five minutes to download). Given that these results were somewhat unexpected, we conducted repeat tests on different days and under different conditions, but our findings were consistent. In 2010, SugarSync released an API – a kind of deconstruction of how their software works, which allows other programmers to put it back together in their own way (usually by incorporating it into their own application). This has led to the development of a number of unofficial applications, such as desktop apps, encryption programs and browser extensions, which provide users with more ways to use SugarSync. All files backed up with SugarSync are transported using Transport Layer Security (SSL 3.3) encryption, which involves a ‘handshake process’. This means that your computer and the SugarSync server authenticate one another and generate a secure encryption algorithm and cryptographic keys before any data is transferred. The idea behind this process is to avoid any outside sources eavesdropping or tampering with your data while it is being transferred. Once in the cloud, files are stored using 256-bit AES encryption – the industry standard for online banking transactions – and are encrypted during the download process as well. If your device is hacked or lost, SugarSync also offers a remote wiping function, which lets you remove data from your phone, tablet or laptop remotely. While these are all good things, SugarSync does fail to provide two of the most important security features: end-to-end encryption and the ability to set a private encryption key. By not offering this, SugarSync are effectively taking hold of your data while it is still in unencrypted form, making it extra vulnerable to outside observers. Private keys are generated by setting a password that is only known by you, and which is never saved or seen by your provider in unencrypted form. When this is not offered, the company are responsible for determining the encryption key used to protect your data, and therefore also have the power to decrypt it at any time. Without these features, SugarSync’s security is relatively weak, so those concerned with the privacy of their data should consider encrypting it using an independent program before backing up, or look to other providers with more advanced security options. SugarSync’s customer support is available almost exclusively in the form of articles and guides on their website – there are very few ways to contact representatives directly. On the plus side, their existing resources are good; the knowledge base contains articles on a broad range of different topics, with a decent search function and a clear layout. You can also find a handy setup guide for new users, and quick and clear video tutorials on the SugarSync YouTube channel. There are plenty of answers to be found by searching through these resources. If you’re still stuck, though, things start to get more difficult. There’s no live chat option on offer, and although phone support is available, you’ll have to pay out $99.99 per year for the privilege. No, really. Fortunately, there’s no charge for submitting a support ticket, but replies aren’t exactly speedy – it took almost two days for us to get a response to our request. The only other way to get a tailor-made response to your question is via SugarSync’s forums. There’s an archive of around 90 posts in total, but the boards seem to be largely inactive now, with recent questions getting no replies at all. It’s another place to look for information, but we wouldn’t count on getting a prompt reply. SugarSync’s social media profiles (including Twitter, Facebook, and a blog) are primarily used as a tool for promoting their product, with plenty of retweeted reviews and regular special offers. It does provide some customer support as well, however; with posts explaining how to use new software, or providing useful hints and tips for backing up. Updates are not particularly regular, but big news is reported quickly and consistently, and there’s some useful material if you care to look for it. It’s easy to sign up for SugarSync, and the installation process is standard, as well as relatively quick. The interface is attractive and easy to navigate, although the lack of anywhere to review and change your settings is odd. There’s also something awkward about running backup-style software that performs basically the same functions as a Dropbox or OneDrive folder – it felt a bit excessive, and left us expecting more. You can add files to your Cloud storage by using the ‘manage folders’ icon on the home screen. It’s only possible to upload folders, not individual files; which can be annoying as it makes selecting specific files a somewhat fiddly process. Once you’ve set it up, however, there’s a useful ‘File Transfers’ tab that lets you see which uploads and downloads you have queued up. You can’t restore files from SugarSync’s desktop program; instead, you have to go via their website, where you can view your backed up files and download or share them. Although it would be nice to run both uploads and downloads from the desktop program, the website is easy to use, and downloads run smoothly once you get started. Individual files can be restored with just a click, while folders are zipped to save time. The SugarSync app is well-designed and intuitive. From the ‘Folders’ tab, you can view, share, sync or export (download) backed up files, as well as uploading data from your mobile device. You can also use the app to view your shared items, and enable offline access – allowing you to see your files without an internet connection. It’s a thorough and useful app that lets users make full use of SugarSync’s sync and share options. 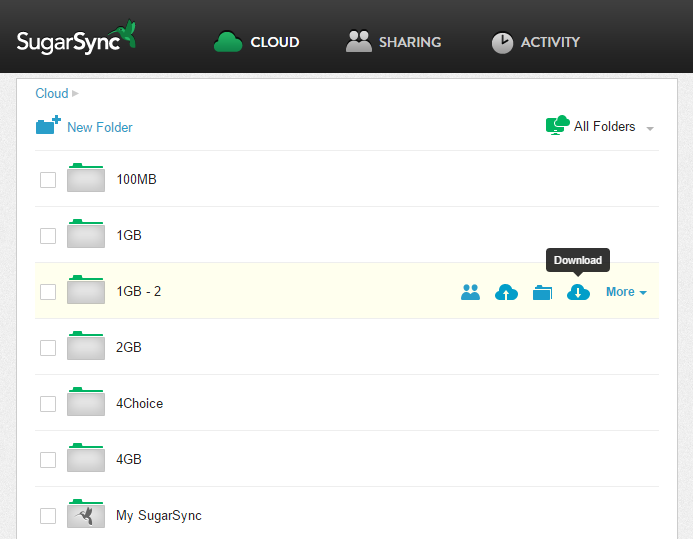 SugarSync is undeniably a very good tool for file sharing, with some useful features. Despite this, we didn’t love it – the poor customer service was disappointing, and we found the software a little too simple for its own good. Repeated comparisons to backup providers left us searching for more features, which were largely absent from what is essentially a basic storage and file sharing application. Ultimately, SugarSync is not a bad product, and if you’re looking for Dropbox with a few extra flourishes, it’s a good choice. However, it doesn’t really bridge the gap between online storage and online backup solutions. Been with them for 4 or 5 years now. Good so far as syncing goes. If you rely on the online copy of your files beware – they have no version states for your folders, can’t trace your most recent uploads and there is no undo options. Ie SugarSync has no from end – your local device is it. Any mishandling must be solved with your computer as the website has no very limited functionality. What do you think of SugarSync? Leave us a comment and let us know! Sugarsync is a very very shady company, period. For one they lost thousands of my files–I wasted hundreds of hours trying to find these files in emails and other softwares we use. This happened in August–at the time I told tech support I wanted to just cancel and moved over to Google Drive. Lo and behold on Nov 30th Sugarsync charged me for the year!!! On Dec 1st I emailed that I had canceled and that I didn’t want the service. Days later I got an email that said I had to use a special link to cancel!? That is available from 10AM to 2 PM PST!!?!? I tried for weeks and ended up waiting 20+ minutes before giving up. Finally on the 14th I got a reply after 20 minutes of waiting–that I had to email again!?? And they will not refund me for a product I did not want and am not using. So I now have to waste the time and dispute the charge with my bank. Stay away, stay far away. Any company that relies on stealing money is one that should not stay in business long. Ridiculous.